The hills were alive with the sound of music in San Diego during the early 90’s. It was a heady time of fraternity and musical exploration. Bands such as Drive Like Jehu, Three Mile Pilot, Uncle Joes’s Big Ol’ Driver, Fluf, Heavy Vegetable, rust, Trumans Water, Boilermaker, Lucy’s Fur Coat, White Glove Test, Chichilla, Deadbolt, Rocket from the Crypt, Physics, and Powerdresser met in a small bar near the airport to support and entertain each other. The Casbah held a special concert at the peak of this movement. 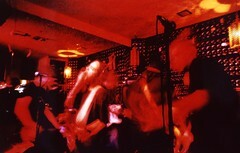 Orca, a San Diego supergroup, was formed from members of many San Diego bands. More than a dozen guitars, bass, and drums packed the tiny stage. In fact, there was probably one musician for every 4 members of the audience that night. I brought a camera and my friend Donnie brought his tape recorder. I was afraid our bootleg of the concert was lost forever. Fortunately, I discovered it while selling much of my stuff for the move to Paris. A friend at work ripped it to MP3 and now it is yours to enjoy. It is 45 minutes long and consists of one multi-part song. Listening to the song brings back vivid memories of the commotion, the heat of packed bodies, and the overall good will of the show. Download: Orca at the Casbah (mp3, 47mb) – This link should work now. this was obviously before the invention of floor pedal tuners. from what i remember, rick froberg(pitchfork, drive like jehu, hotsnakes) was the main wrangler. So, he got me and travis nelson (heavy vegetable, other men), O and johnny donhow (olive lawn, fluf), atom willard (rocket from the crypt), denver lucas (powerdresser), gary davis (custom floor,inventor of the boneless), and todd swank (crankshaft, foundation skateboards) together for 2 practices and 1 show. no one from ujbod was in it. Posted byTed Drake Tuesday, June 5, 2007 Tuesday, April 1, 2008 Posted inCasbah, General, Music, Photos, San Diego and Yahoo!